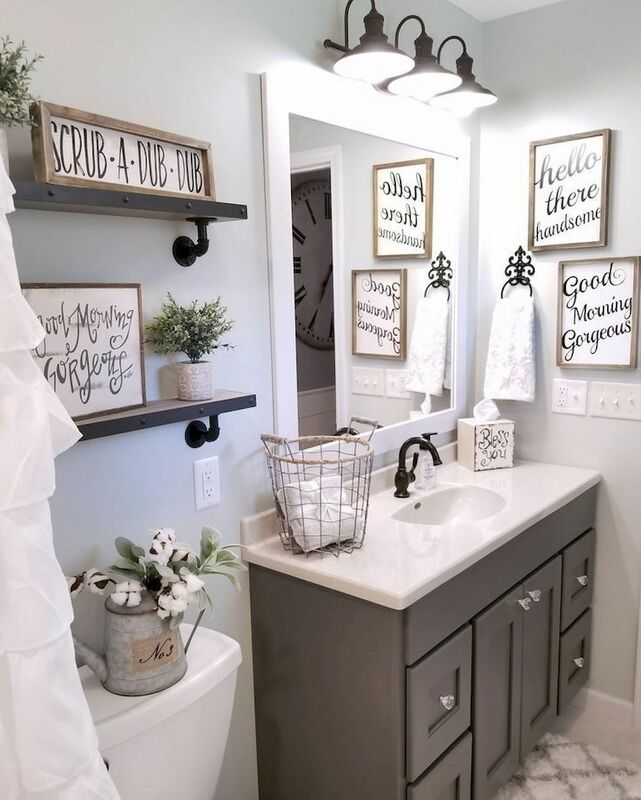 When you decorate your refreshment space, think about bathroom styles, colors, texture, furniture, sets, wall art, and functional bath accessories. That’s how you can create an inspirational atmosphere of renewal. 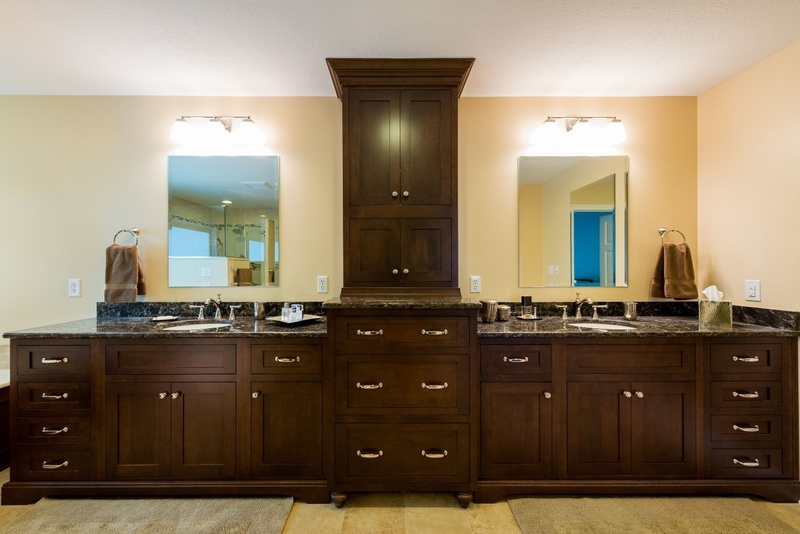 When selecting bathroom cabinets, look for high-quality, functional sets. This will help you to keep your space in a purposeful, congruent style. For example, two identical freestanding bathroom cabinets always look more finished than a mix of styles. 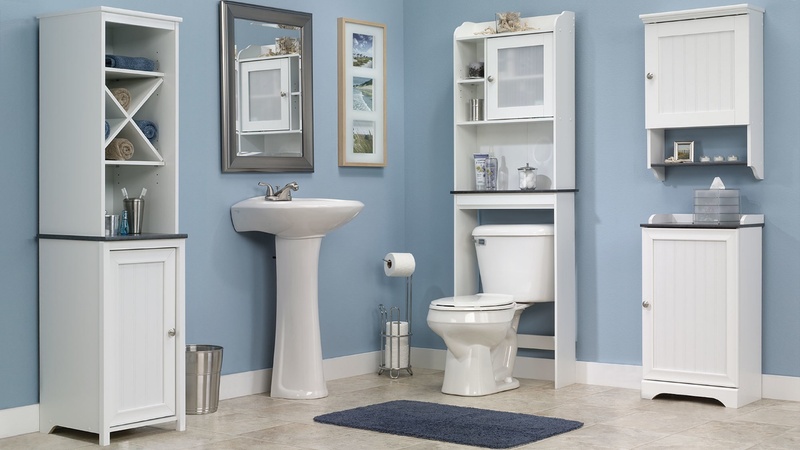 Decorate your bathroom with capacious over-the-toilet storage for ease of use, and choose both wall-mounted and towel cabinets. To create an open effect in your bathroom, choose a pedestal sink. If you want more storage space, opt for a sink with combination under-sink and towel cabinets. Also, pay attention to sink materials, such as porcelain, bronze, or stainless steel. Keep in mind your bathroom style and budget as you select from your options. What about bathroom vanities? This furniture option depends a great deal on the available space. If there is enough room to install the biggest single or double vanity cabinet, use this space-saving décor solution to optimize your bathroom storage. When you decorate your bathroom, look for accessories which are both functional and attractive, to facilitate life and daily hygiene. Each item, including towels, toilet paper, toothbrushes, and soaps, needs a clear place. Drawer pulls, fittings, towel bars, bathroom tray, and hooks to hang your bathrobe are important accessories, as are holders for toilet paper, toilet brushes, toothbrushes, hair tools, etc. To keep your bathroom clean, use trash cans with optimal capacity, a user-friendly opening mechanism, and natural materials. For a finished look, it’s best to choose matching sets. 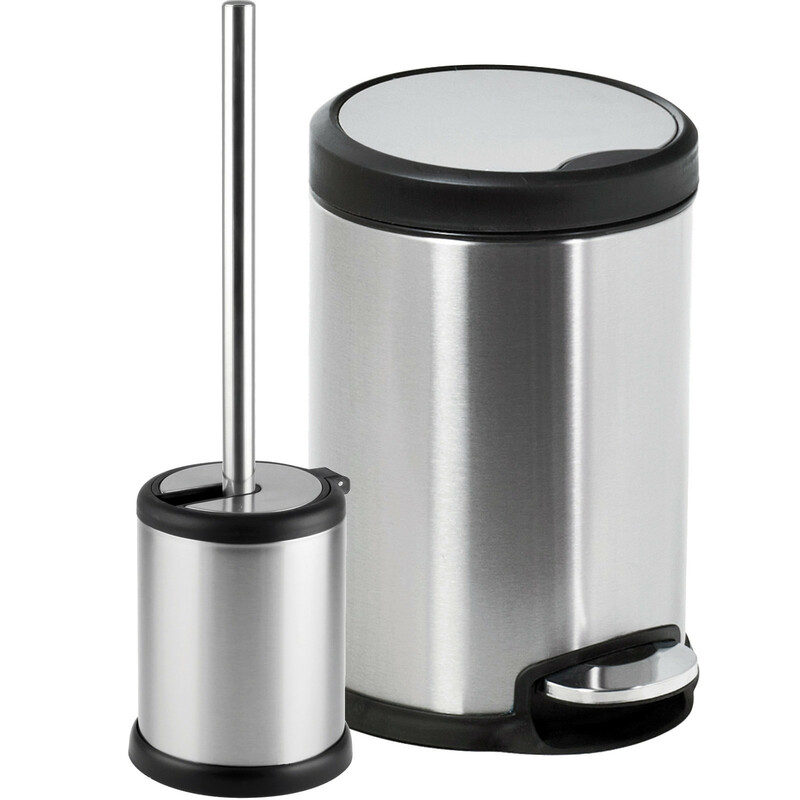 For example, a matching trash bin and toilet brush holder as shown below. For must-have bathroom sets, choose ceramic or mosaic accessories with hand painted prints. 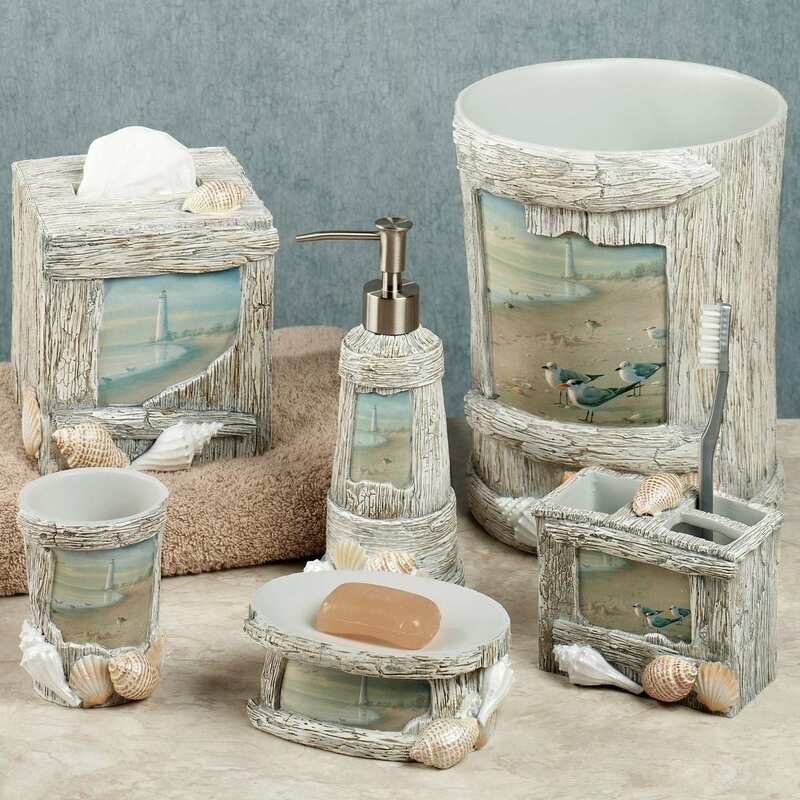 A beach-themed tissue box, soap dish, lotion pump, toothbrush holder, and tumbler add easy-going beach vibes to your bathroom. If you like houseplants in the living room, bedroom, and kitchen, you also may want to add one to your bathroom. Orchids, azaleas, bamboo, and any other plants, which need humid environments are perfect for bathroom plants. Adding greenery can brighten up a bathroom and give it a focal point. For additional creative ideas, think about bathroom storage jars. If you’re a DIY-er, you can use these to add your personal touch. If DIY isn’t necessarily your speed, opt for the simple route and buy jars at a home décor store in any shapes, colors, materials, and styles. 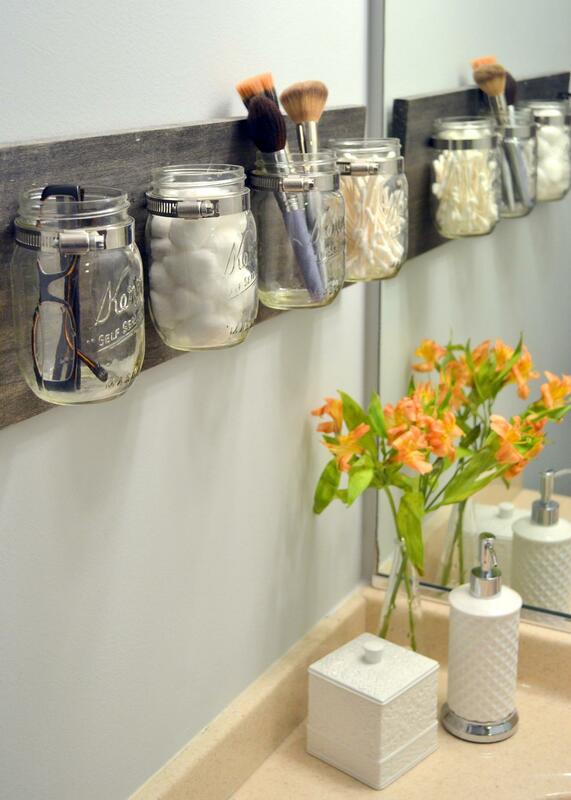 These jars are perfect options for designated spaces for your personal hygiene items and lifestyle accessories. Hanging jars will also save a little bit more space in the cabinet. 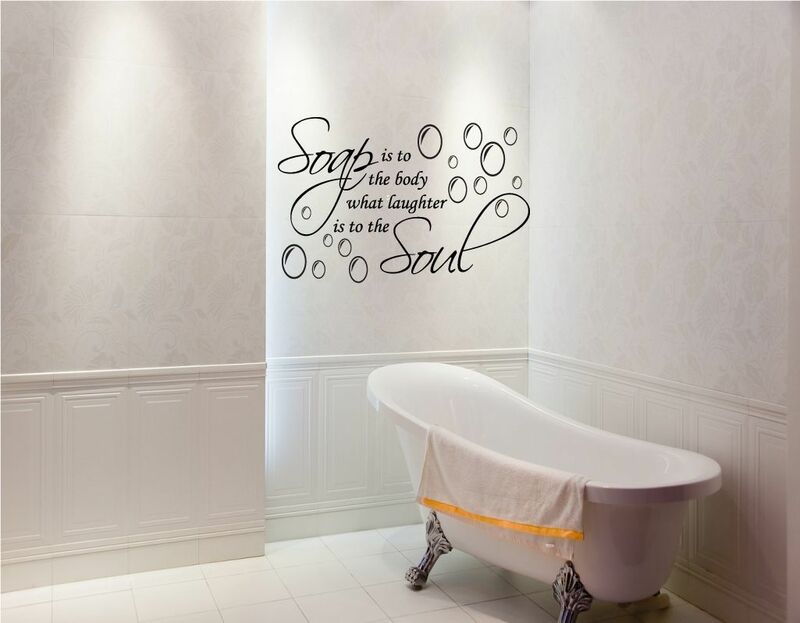 When you decorate your bathroom, an artistic element can help to create a relaxing ambience. Liven up bare walls with stunning bathroom wall art. Think about laminated waterproof canvas prints, such as photography, pictures, inspirational phrases, and artwork. If you want to add useful wall décor with a functional purpose, think about a large framed mirror. Show your passion for music, running, or dancing in an art gallery on the wall in your bathroom. Place a few art pieces at equal distance from each other and enjoy the elegant art. 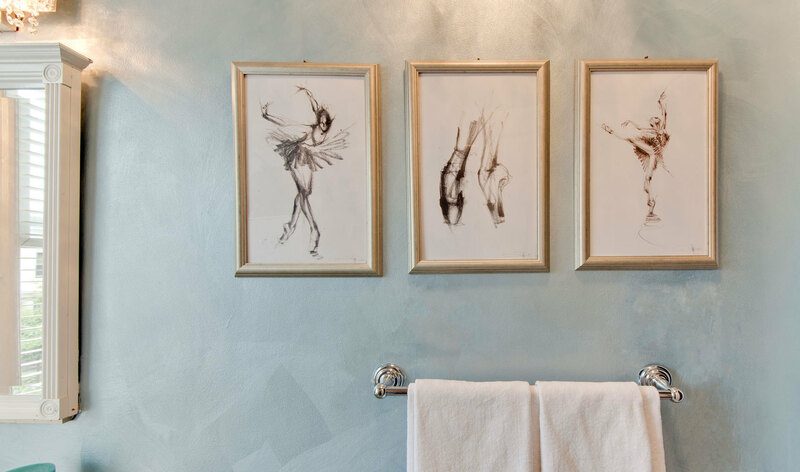 For example, the bathroom wall art such as this ballerina's movements make you feel light and free. 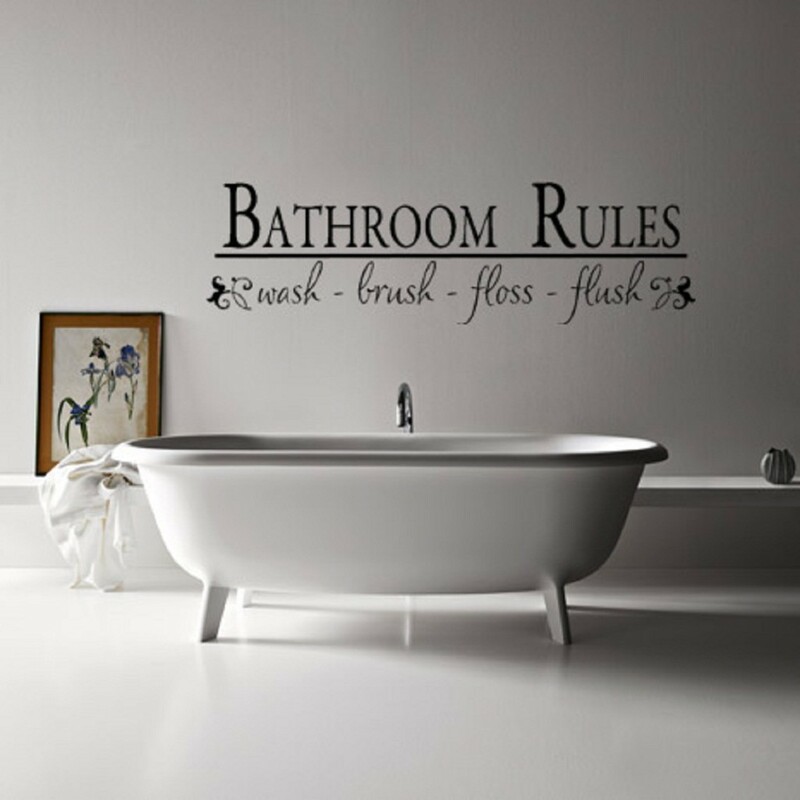 If you’re a little bit of a control freak when it comes to hygiene (and it isn’t uncommon) put up your bathroom rules as wall décor. When you illuminate your bathroom, consider the shape and size of the room. If you have enough space, combine a few bathroom lighting solutions, such as LED track lighting, wall/ceiling, and pendant lights. 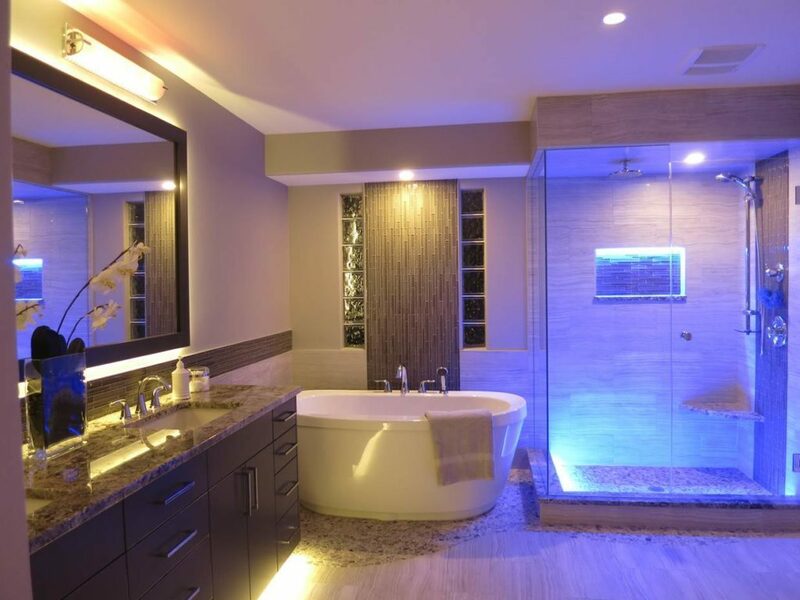 Keep in mind the main purpose of lighting in your personal bathroom space. If you need sufficient lighting for washing, shaving, or applying make-up, choose functional task lighting. If you want to create a romantic and relaxing atmosphere, ambient lighting is exactly what you need. When you decorate a small bathroom, try to organize the functional refreshment space and avoid clutter. Cluttering a small space just makes it look even smaller. Try to fill your space with useful, functional items. 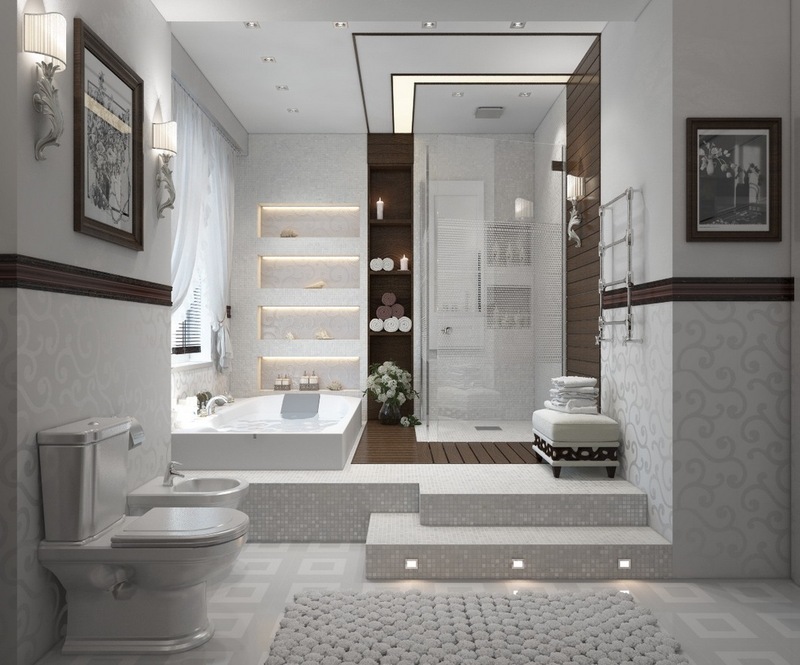 It`s better to separate your bathroom into three areas: washing (a shower zone), toilet, and bath cabinet. 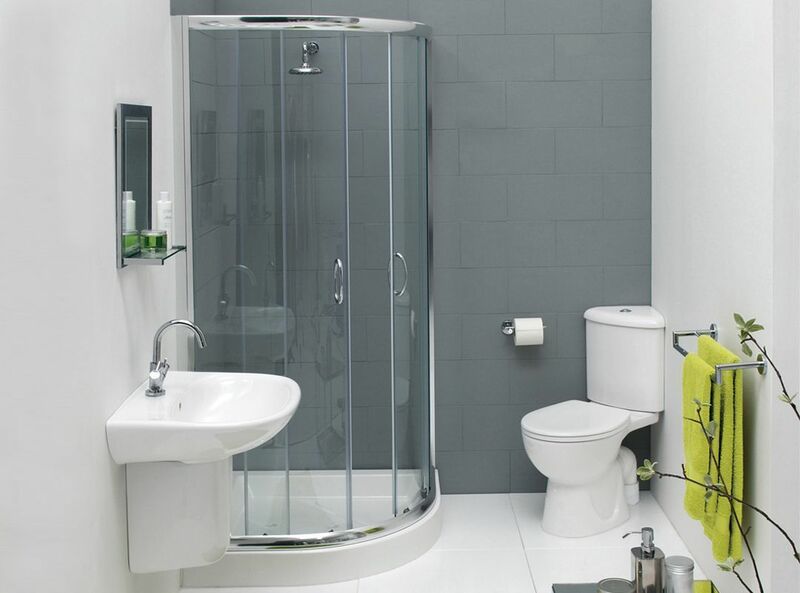 If you have the option, install a glass door to separate the shower area from the rest of the bathroom space. Considering colors, choose neutral light hues. For example, a pure white is always a good solution when you work with a small space. 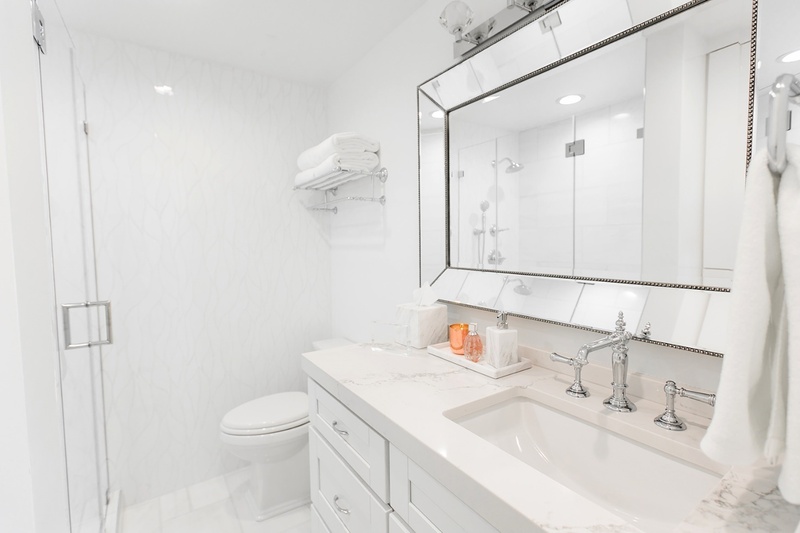 White and other light colors can help to make your small bathroom look larger than it really is. 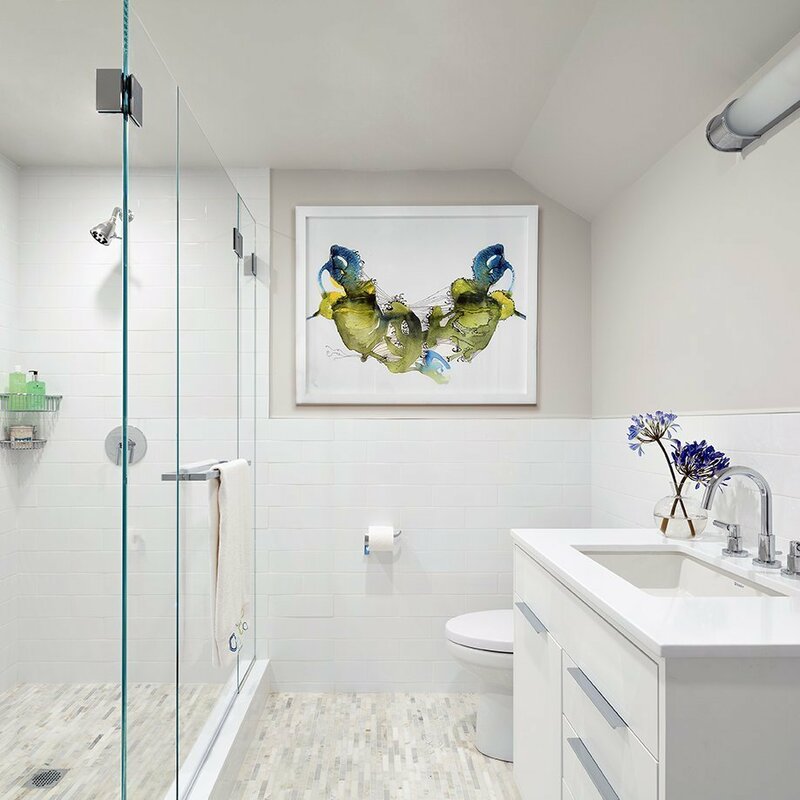 Think about bright artwork, which can be the main focal point of your small bathroom. Choose white-framed pictures or photography to emphasize the clearness of bathroom wall décor, which harmonizes with other design items. Add colorful plants or flowers to liven up your white bathroom. 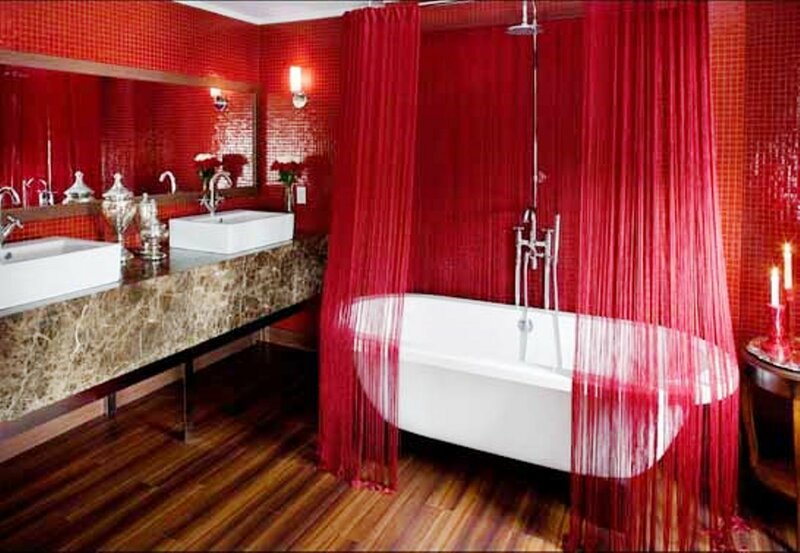 When choosing a color scheme for your bathroom, keep in mind your overall style. 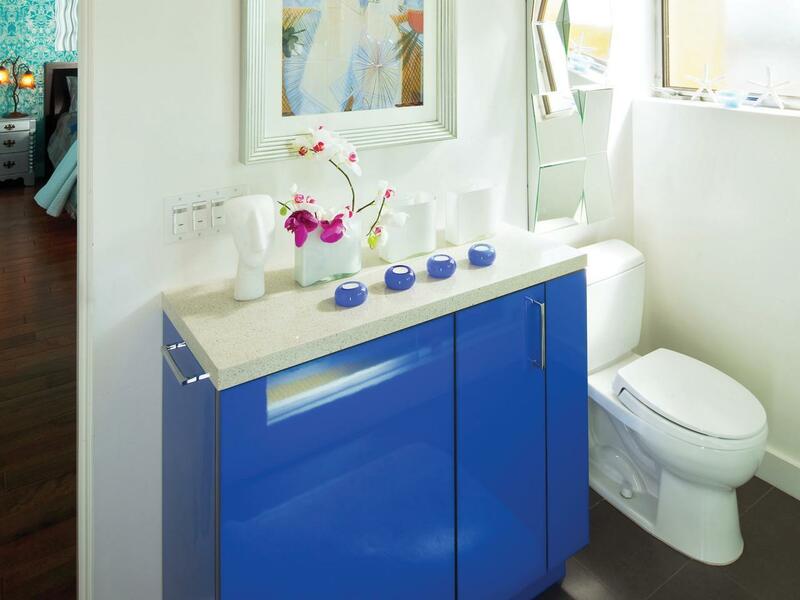 Properly selected colors emphasize a refreshing bathroom atmosphere. 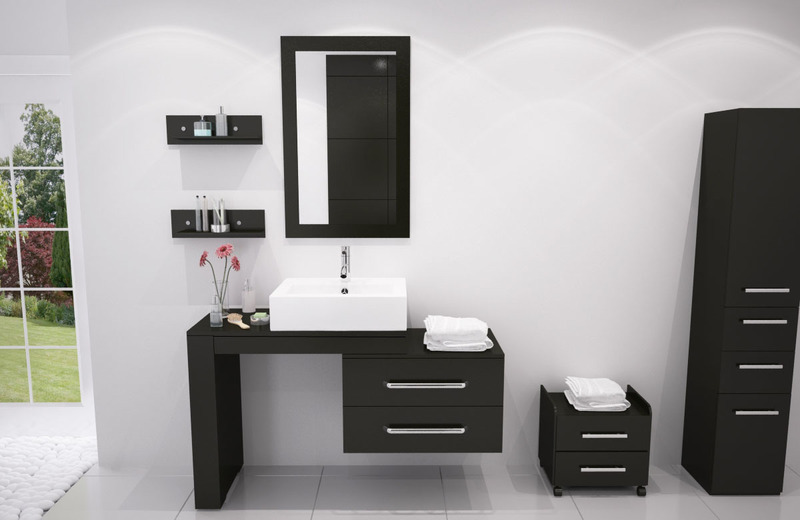 If you’re giving your bathroom a makeover, think about cleanliness of lines and shapes. If you choose a pure white, you can create a distinct interior. 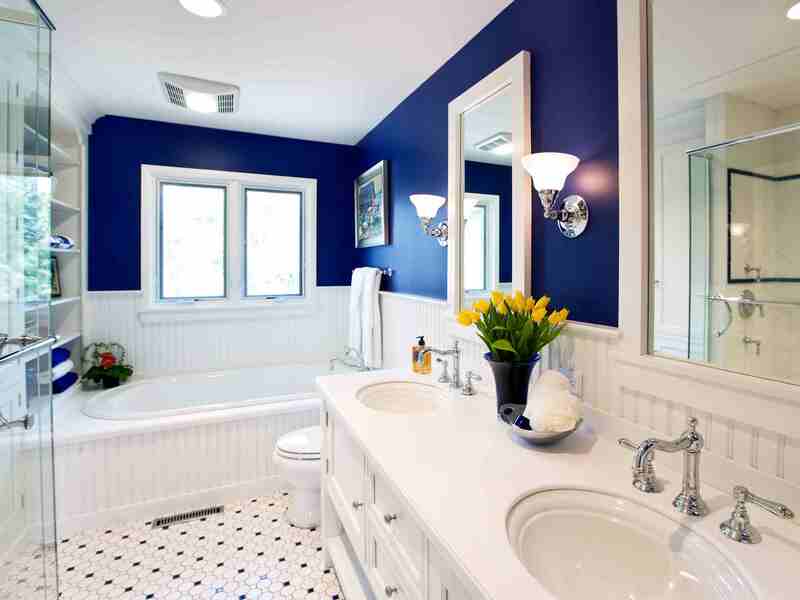 This color solution works equally well for large master bathrooms and small spaces. 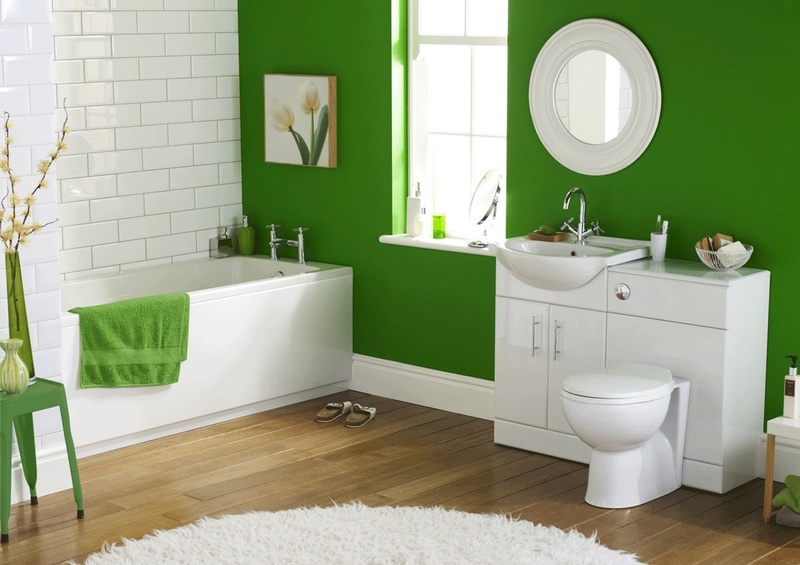 When decorating your bathroom, think about the contrast between white and bright or bold hues. This can help you to create a stylish look and energetic atmosphere. Are you tired of playing with colors? 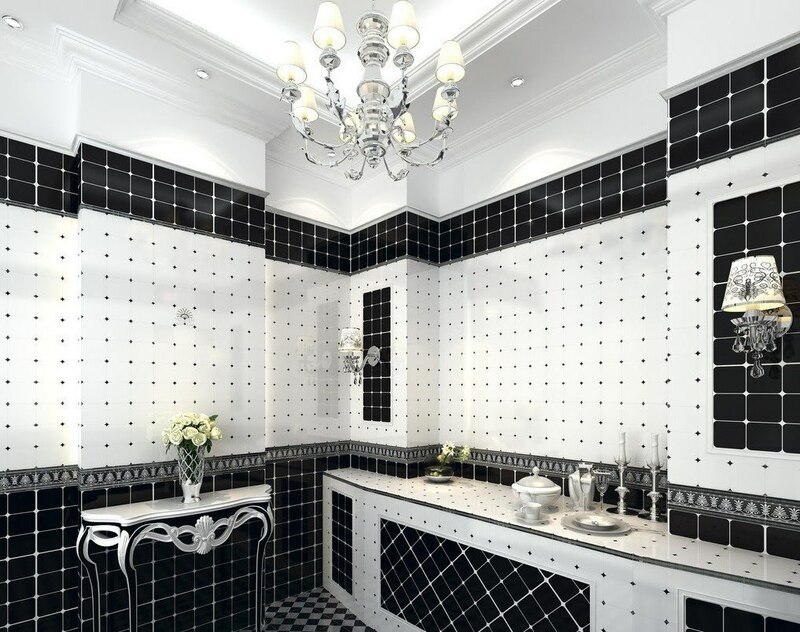 Try contrasting white with bold black. This combination can emphasize an elegant, classic interior. Yellow is a sunny color, reminiscent of natural motifs, such as autumn leaves, fish, flowers, and birds. 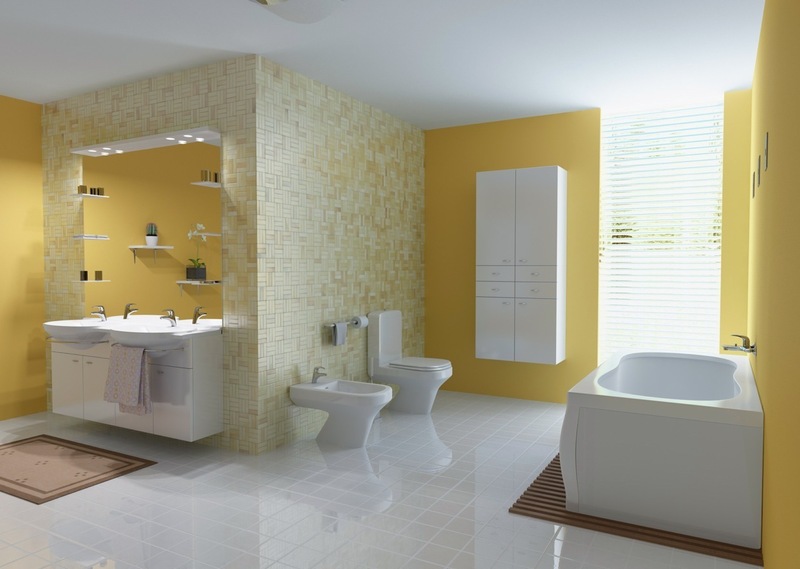 Combining a bright yellow with clear white is a shot in the arm for your bathroom décor. 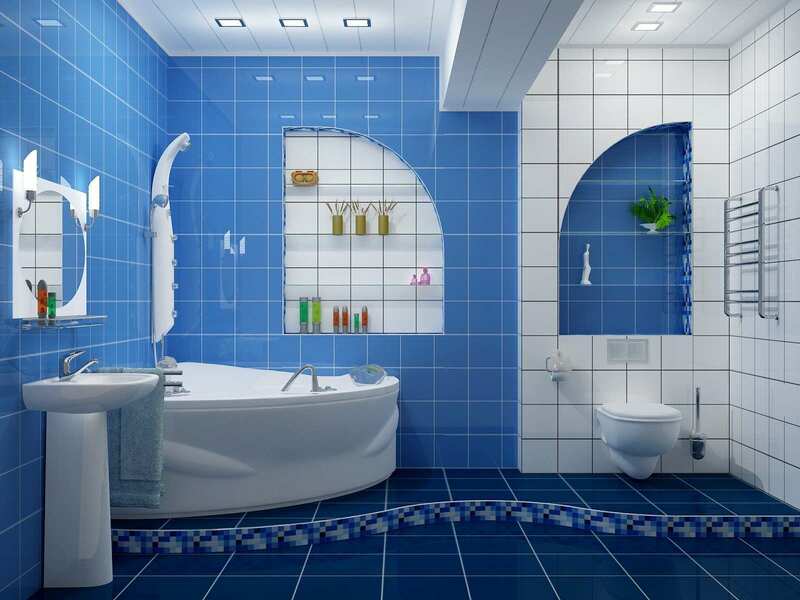 A combination of blue and white adds a natural touch to your bathroom décor. If you contrast light blue-and-white walls and ceiling with dark blue flooring, you’ll emphasize the ever-changing atmosphere of the ocean’s waves. What about passion? If you have a vivid personality, choosing a striking red emphasizes your lifestyle. Taking a bath or shower in the morning or after a long day helps you to feel more energetic. 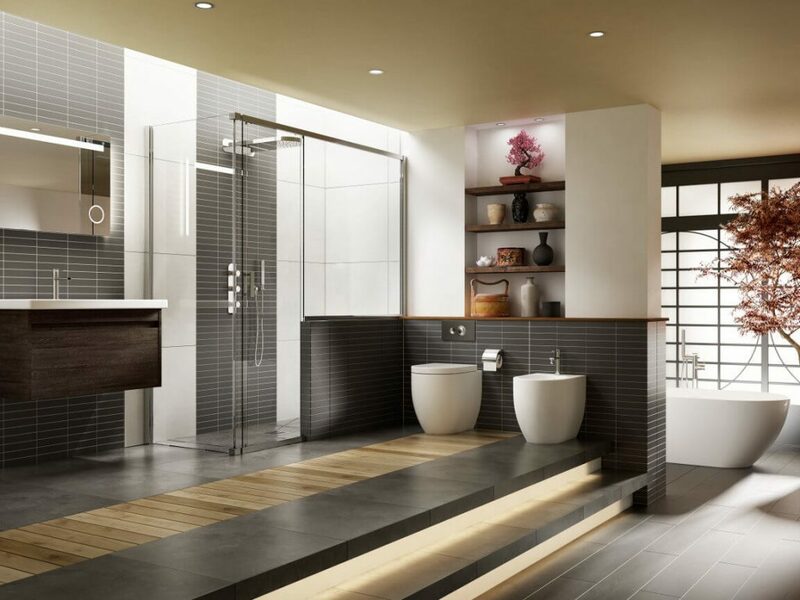 As you’re exploring various bathroom styles, think about your overall comfort and aesthetic pleasure. 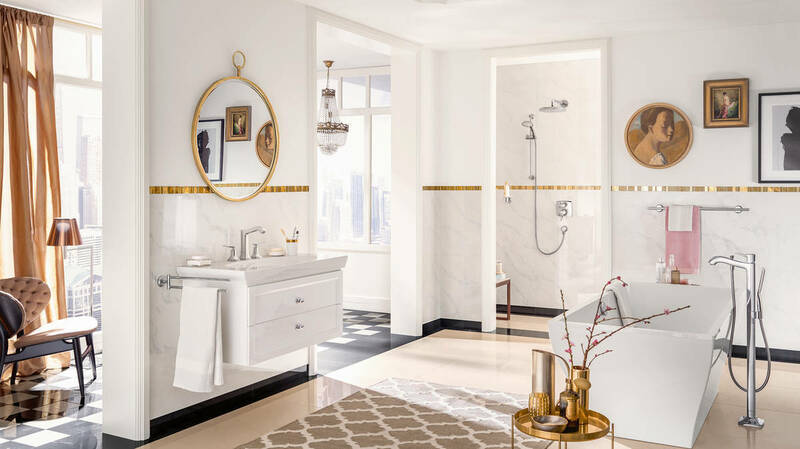 If you have a master bathroom, with both a shower and a bathtub separately, you may be able to afford more space to functional furniture and bathroom accessories with an open-space feeling. Pure simplicity with clear lines in a large minimalist master bathroom gives an aesthetic pleasure. 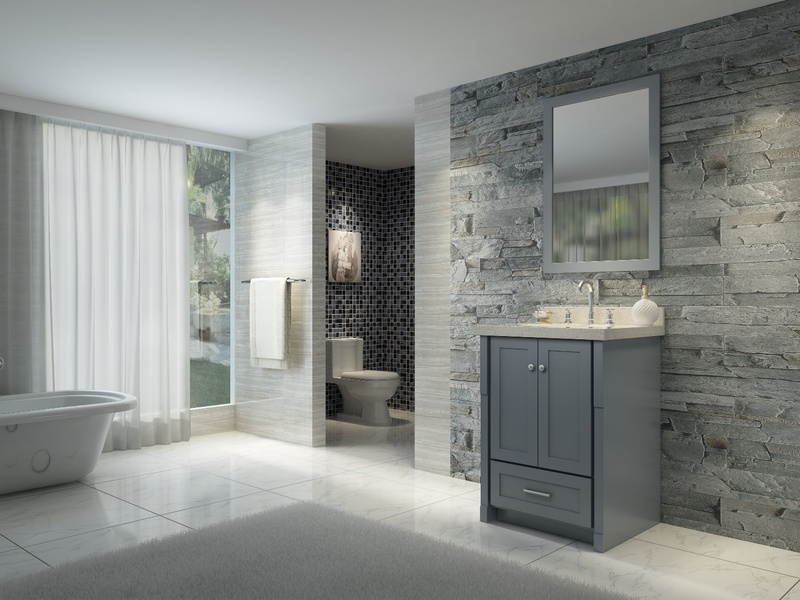 If you prefer clutter-free open space with clear lines and neutral color combinations, choose a contemporary style bathroom. Accenting ultra-modern materials and pure simplicity without fussy décor elements, you can create a perfect functional space. 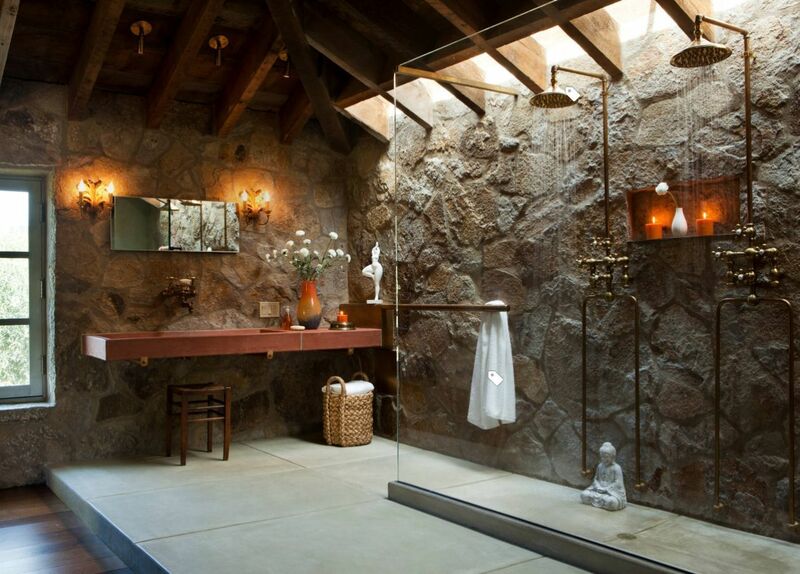 If you are a fan of rough surfaces and natural materials, such as wood, stones, and glass, give attention to a rustic bathroom style. This design solution shows a free personality, who knows everything about craftsmanship. When selecting your bathroom style, think about inspirational décor elements. If lovely knick-knacks, handcrafted details, and wall art are your cup of tea, choose a casual country style. Take a look at farmhouse décor details, such as wire baskets and vintage hooks and holders, for bathroom accessories. 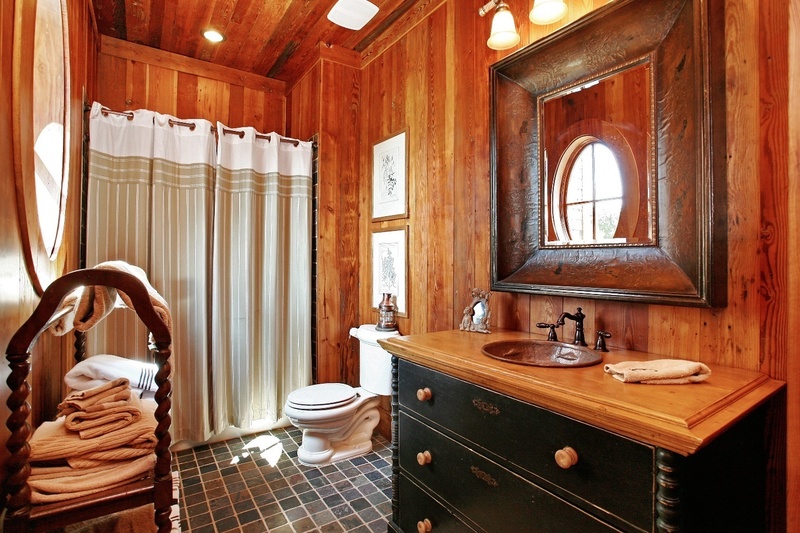 What about a Western bathroom style? If you want to feel your American Indians roots and native spirit, decorate your bathroom with treated and untreated wood, heavy framed mirrors, brightly patterned tapestries, clear shower curtains, and earth tone tiles. 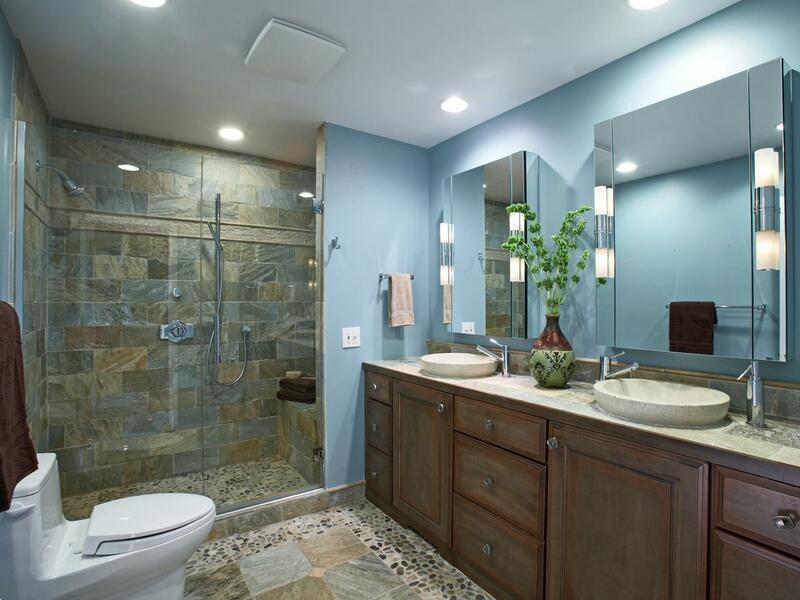 If you like green interiors with plenty of lights, choose a tropical bathroom style. Use many green plants, exotic woods, jute fibers, simple patterns, and clear color accents. This amazing natural décor gives a breath of fresh air to any bathroom space.